The rectus femoris is one of the powerful quadriceps muscles at the front of the thigh. A strain or tear in the tendon can occur at its origin at the front of the hip. An avulsion strain (or fracture) is when the tendon tears at its attachment, pulling a small fragment of bone with it. Tendinopathy or tendinitis will have occurred gradually through overuse or a strain that has failed to heal. Symptoms of a torn rectus femoris tendon include a sudden sharp pain at the front of the hip or in the groin usually whilst doing some explosive activity. Swelling and bruising may occur with pain when lifting the knee up against resistance. Tenderness will be felt when pressing in where the muscle attaches at the front of the hip. The severity of the symptoms depends on whether the rupture is partial or complete. If a complete rupture has occurred then it will be impossible to contract the muscle and a gap or deformity may be visible. 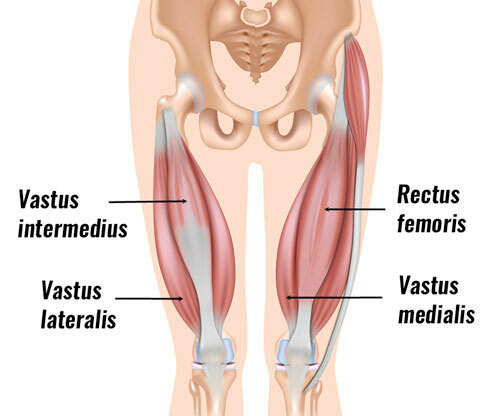 The rectus femoris muscle is the large quadriceps muscle that runs down the center of the front of the thigh. It is a biaxial muscle meaning it crosses two joints, both the hip and knee joint. It is used to straighten the knee (knee extension) or lift the knee up (hip flexion). As a consequence, there are often very large forces transmitted through this muscle, especially when kicking or jumping. A rupture of the tendon at the top of the muscle near the hip can be caused by overuse or explosive loads on the muscle like sprint starts or kicking a ball. This tendon can rupture or become inflamed at the upper part near the origin at the hip. The main cause of this is overuse through kicking or explosive movements as in sprint starts. Rest and apply cold therapy and compression immediately. Ice can be applied for 10 to 15 minutes every hour for the first 24 hours or so during the painful acute stage. Frequency can reduce to two or three times a day as symptoms subside. A professional therapist may use ultrasound and laser treatment to help with the pain, inflammation and healing process. Sports massage after the acute stage can be beneficial both cross friction massage applied to the tendon and deep tissue massage to relax the muscle itself. If the tendon has torn completely then an operation to repair it will be required. A full rehabilitation program of stretching and strengthening exercises should be done before more sports specific functional exercises to return the athlete back to full fitness. A partial rupture of muscle can lead to inflammation after the initial rupture has healed. You can avoid groin injuries by ensuring the muscles are strong and flexible through strengthening and stretching exercises. A rectus femoris avulsion fracture occurs when a strong contraction of the rectus femoris muscle pulls the tendon and a small piece of bone away from the attachment point. The rectus femoris is the quad muscle that crosses the hip and knee joints which can make it more at risk of injury, especially after explosive movements. Pain at the front of the hip. Pain comes on suddenly, usually after a sudden or forceful movement of the knee or hip. Tenderness when feeling the area of bone at the front, just above the hip. Decreased strength in hip flexion and knee extension. The Rectus Femoris muscle is the only of the four quad muscles which cross both the hip and knee joints. This makes it more susceptible to injury. An avulsion fracture of the Rectus Femoris occurs after a strong or explosive contraction of the muscle. Alternatively, over-stretching the muscle can cause this injury. This is done by bending the knee with the hip in an extended position (so the thigh is moved backward). Avulsion fractures of the rectus femoris attachment point (the long head – AIIS) occur most often in adolescents as this area is one of the last to fully harden to bone, from cartilage. Apophysitis may develop first. This is an inflammatory reaction to repeated stress on the soft bony attachment. If an avulsion fracture is suspected, seek medical attention. An X-ray or MRI scan will be conducted to confirm the diagnosis and determine the size of the fracture and amount of displacement. Most cases can be treated conservatively, similar to that of a rectus femoris rupture. Treatment includes rest, ice and anti-inflammatories which may be prescribed by your doctor. Once pain has subsided, strengthening exercises are recommended to regain full knee and hip strength. Only those injuries where the bone fragment is separated by 3cm or more from the attachment point require surgery. The rectus femoris is the large quadriceps muscle running down the middle of the front of the thigh. Its function is to lift up the knee and straighten the leg. Pain will come on gradually and normally be located at the front of the hip. Read more on the symptoms and treatment of this hip injury. Symptoms include a gradual onset of pain and tenderness at the front of the hip. There is unlikely to be a sudden sharp incident of pain although chronic tendonitis can develop following a rupture. Pain may be reproduced when attempting a straight leg raise or trying to lift the knee up against resistance. Pain and stiffness may be worse first thing in the morning or after periods of rest. Rest and apply cold therapy to reduce pain and inflammation. Maintain your fitness by cycling if this can be done pain-free. A doctor may prescribe anti-inflammatory medication e.g. ibuprofen to reduce pain and inflammation. A professional therapist will use ultrasound or laser treatment with sports massage to aid the healing process. A full rehabilitation program is needed consisting of stretching and strengthening exercises to avoid re-injury.